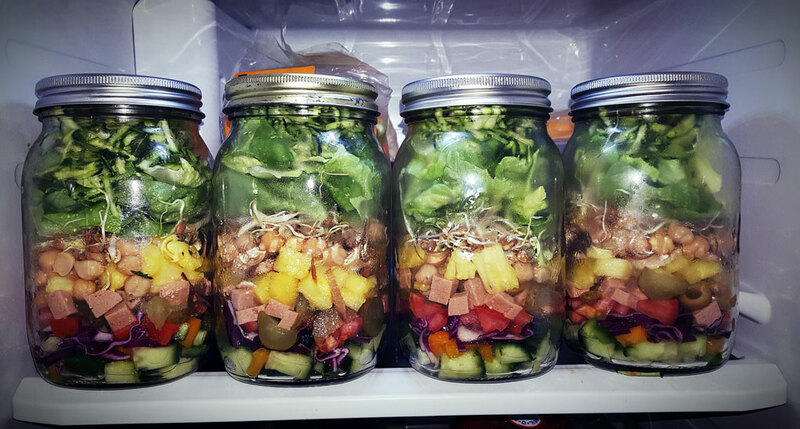 When it comes to making healthy lunches, planning is crucial. The good news is that once you get used to the routine it becomes easier. Choosing foods that stay in the fridge for a few days without going bad is key. As a general rule cooked foods should be stored in the refrigerator and be eaten within 3 to 4 days. This is why you might want to take some time Wednesday to cook a few things such as quinoa. Rice: 4 to 6 days in the refrigerator or 6 months in the freezer. Beans: 3-4 days in refrigerator or 1-2 month is freezer. Chicken: 3-4 days in refrigerator or 4 month is freezer. Boiled eggs: 1 week in the fridge. Hummus: see the label. Most are good for up to 5 days after opening. Foods that freeze well include: soup, stews, chili, pasta sauce, bread, baked goods, or homemade bars. You can use flour tortillas, pita bread, collards or romaine lettuce as your wraps. Fill the wrap with your favourite fillings. Egg and tuna salad is good in romaine lettuce. Refried beans, salsa and cheese are good in a flour tortilla. Make a salad and stuff it into pita bread. Ideally you would have all the ingredients on hand and make your wrap in the morning so that it doesn’t get soggy overnight. You can also bring the filling in a separate container and make your wrap at lunch time. For those who love variety, the possibilities are endless! If you need some ideas check out this post and if you want to make an extra special bento try these. Make a big batch and freeze in individual portions for a quick lunch. Use a slow cooker to save time. Add steamed, roasted or raw veggies over cooked rice, quinoa, rice noodles or another grain. Top with it beans, nuts, or lean meat for added protein and add a drizzle of your favourite sauce. This is a simple and delicious sauce that will keep in the fridge for up to a week. You can add it to a veggie bowl, salad or use it as a dipping sauce. Blend 1/2 cup tahini, 1/2 cup lemon juice, 1 garlic clove, and a 1/4 cup water. Layer some rice, refried beans, salsa and avocado. This is one of the quickest lunches to put together when you have everything on hand. Once your meals are prepared, pack them in containers free of BPA and other toxins. It’s best practice to stay away from plastic as much as possible. If you do use plastic make sure they are dishwasher safe if you use a dishwasher and do not heat your meals in plastic. Some ideas for safe packaging include: mason jars, stainless steam thermos and parchment paper. Ikea sells these glass containers that have good lids so they are less likely to leak. Terra 20 has a few stainless steal contain options such as this 2 layer sandwich box. If you have children include them in the planning and prepping process so that they get into the habit of preparing healthy meals.